Campus is typically pretty quiet during the few weeks between Reunion and the advent of the Bates Dance Festival in July. But if you can’t take the peace and quiet, this summer you’re in luck. All you have to do is stand by the Class of 1932 Sundial in front of Coram Library. 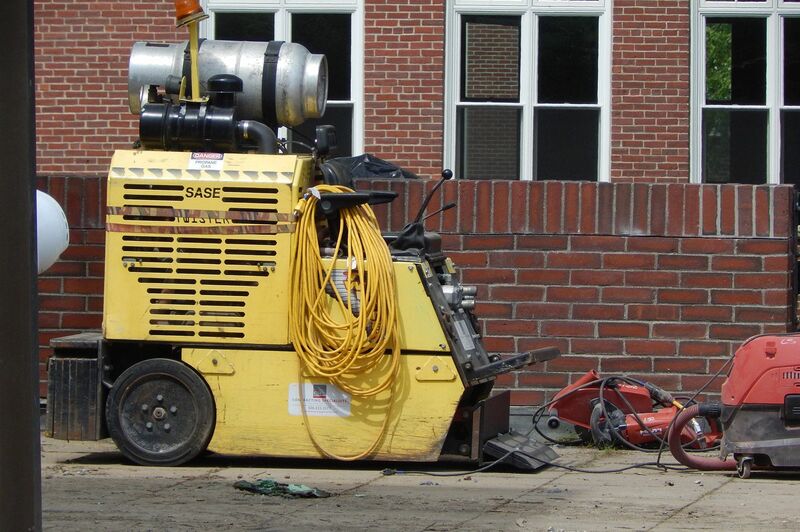 It’s a great spot to hear the roar and clatter as Almighty Waste hauls away the Ladd Library Terrace. This week, the Auburn-based, intriguingly named Almighty has had two or three green dumpsters at a time staged by an entrance to the terrace, and trucks keep coming onto campus to remove them as they’re filled. 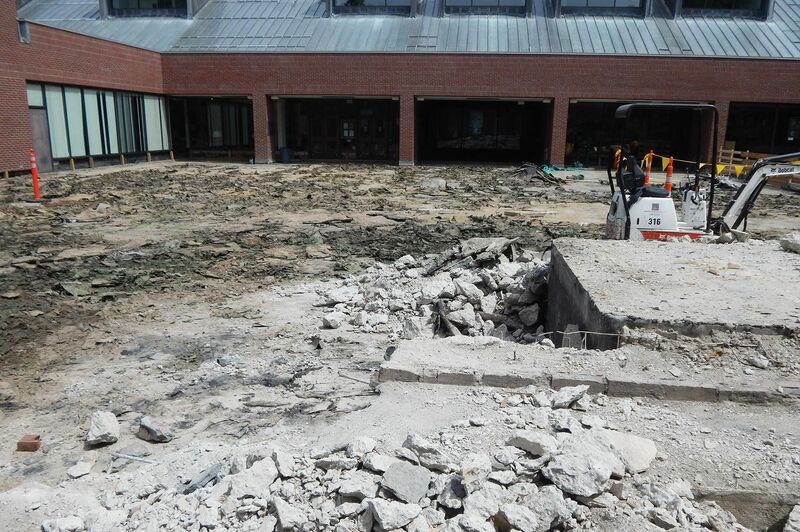 What they’re carting away is a smelly mix of broken concrete pavers, sand, bricks, fibrous insulation, and other materials that were once layered over a water barrier underlying the plaza, which spans Ladd and Coram libraries. 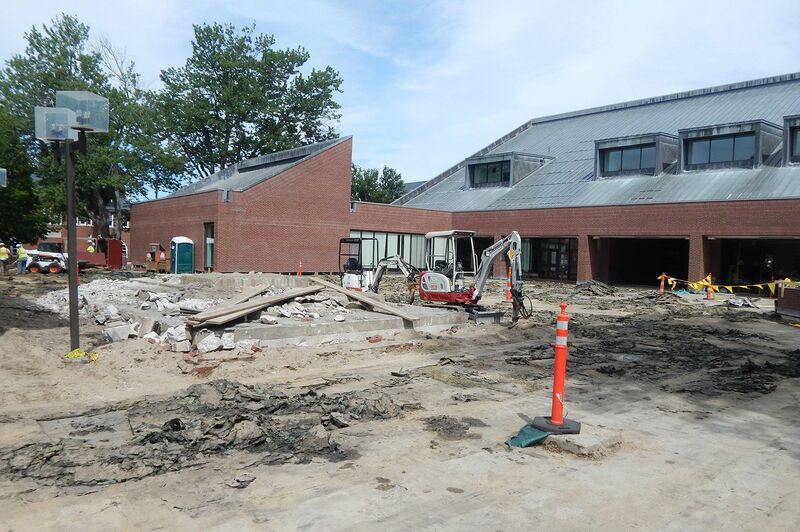 The water barrier is kaput, and, in one of the summer’s major construction projects at Bates, the Massachusetts firm Contracting Specialists Inc. is replacing it. 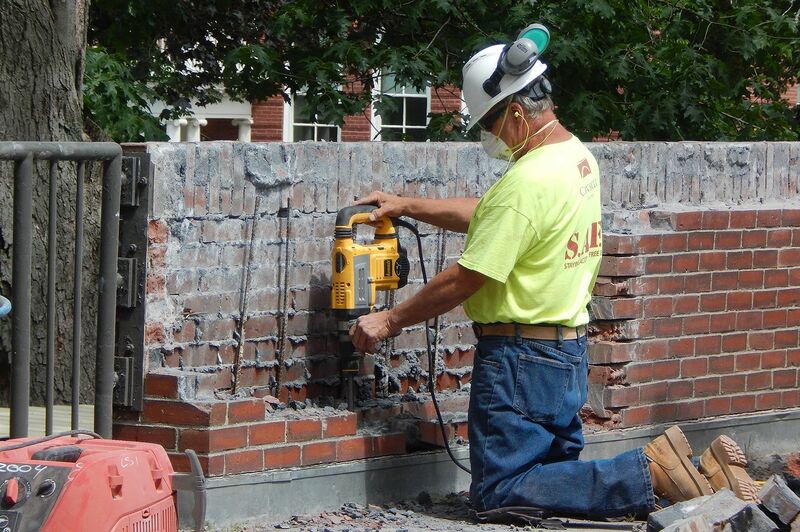 Like moths to a flame, we’re irresistibly drawn to demolition. 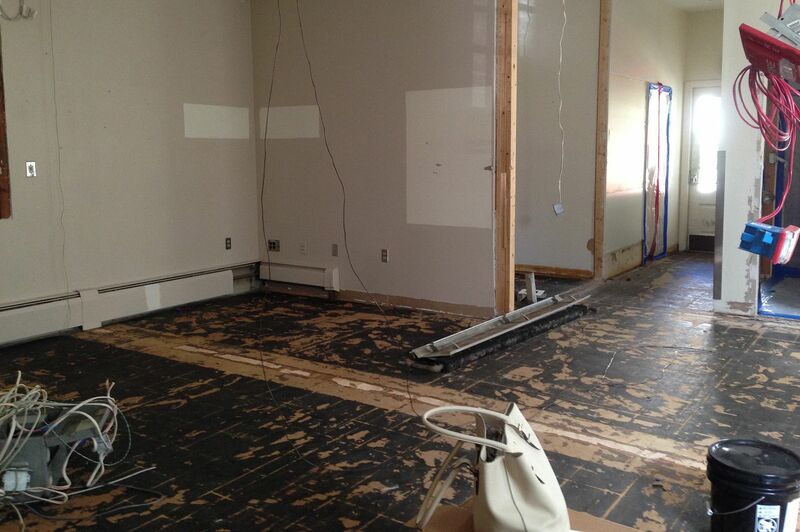 When we visited the site this week, the disarray was captivating. Aside from one patch of bricks, the pavement was all gone and much of the supporting material had also been scooped up and taken away. The old planters had been emptied and set disconsolately in one corner. Making it look as hard as slicing a Jello salad, a mason used a power chisel to take down part of a chest-high brick wall on the side of the plaza facing Hedge Hall. That was one of the spots, Farnsworth explained, where some of the existing barred railing would be replaced with an attractive new cable barrier. The idea, Farnsworth said, is to open up sightlines onto the terrace, part of a campus-wide campaign to provide inviting perspectives into desirable spaces. Getting back to bricks, Farnsworth had some interesting masonry facts to share as we contemplated Coram’s easterly wall, which faces Ladd and the terrace. He pointed out that the bricks that constitute the old library are 2 1/8 inches thick, an eighth-inch less than the more recent bricks on Ladd. Coram’s building envelope is all brick, three layers thick (this could turn into poetry if we worked a little harder at it … nah). The bricks are predominantly laid in a pattern called Flemish bond — bricks laid the long way alternating with the short way, aka “stretchers and headers.” Ladd’s pattern is the plain stretcher bond, bricks all set lengthwise. The vaguely purplish or raspberry discoloration around the perimeter of some old bricks was caused by fumes from the charcoal the bricks were fired with back in the day. So if you want to give someone the raspberry, you can either make a rude noise or throw an old brick at them. 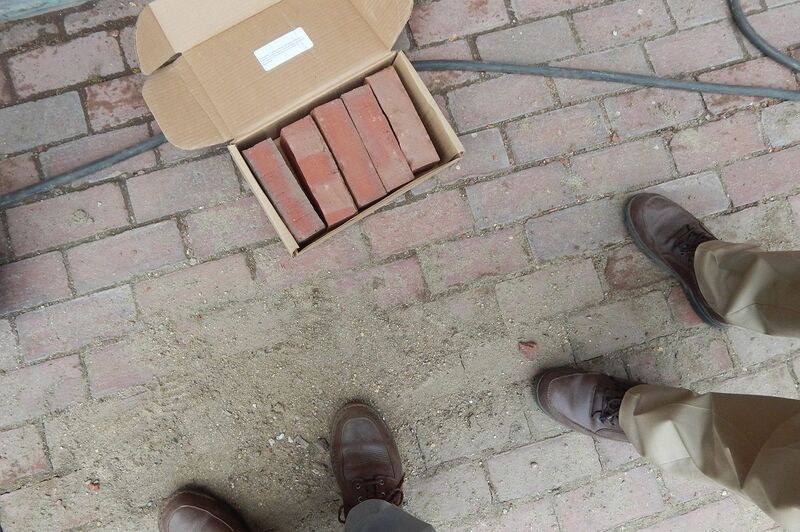 New bricks, which are gas-fired, can have a brown perimeter that, as far as we know, has no nickname related to food. Farnsworth indicated a cardboard box of brick samples from Morin, the brick manufacturer over in Auburn. The samples will inform a custom order to replace a few courses of the outermost layer that have been removed at the foot of the Coram wall. Extracting them exposed old waterproofing measures: a confusing system of flashing and the no-longer-waterproof water barrier, which turns right up here like the edges of a tray. Brick, you see, is porous, and water seeps down through it. (One of several reasons that brick umbrellas were a commercial failure.) 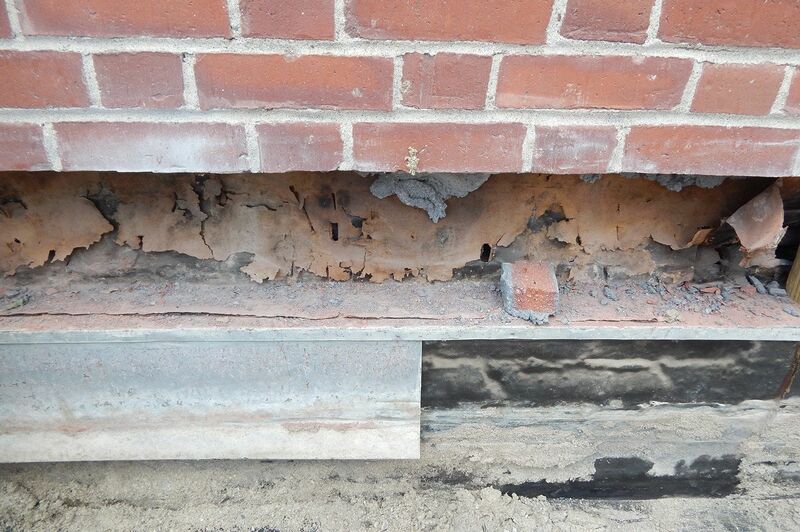 The flashing and membrane at the foot of the wall were meant to divert the water toward drainage, Farnsworth explained — but the membrane now leaks, and the flashing wasn’t embedded deeply enough into the brickwork to work properly. All that will be corrected. On June 25 or thereabouts, once the membrane is laid bare, a worker will ride around on a small machine that peels it off. Cracks in the double-decker concrete deck will be caulked. Then, following a site inspection by the manufacturer, The Henry Company of El Segundo, Calif., the new waterproofing will be laid and a new Dagwood sandwich of topping materials stacked over it. 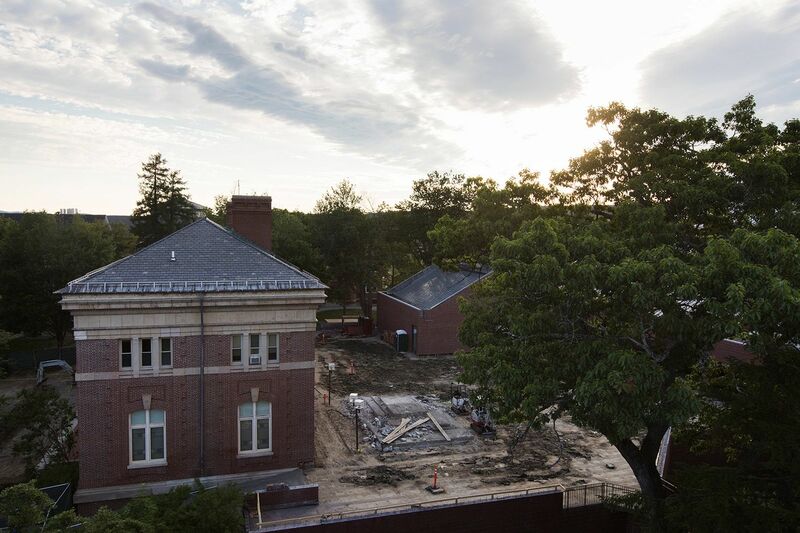 Doors opening onto the terrace from both libraries will be set aside temporarily, as the waterproof layer will extend right into the entryways. In the meantime, around on the other side of Coram, what’s happening with the extension of its famed porch, the scene of so many Commencements, Convocations, and midnight heart-to-hearts? There on the Historic Quad side of the building, there has appeared a construction fence — but you can slip around the left side of the porch to a pathway left open for building access. From there you can admire a trench that’s been dug for a foundation footer and frost wall. The forms for the concrete will be placed next week. The footer and wall will support an on-grade concrete slab that will serve as the basis of the new extension. Big granite pavers will top it off, but that’s all some time away, as is the construction of new entries to the Ladd Terrace from the quad. All that needs to be ready by Sept. 4 — Convocation, says Farnsworth. 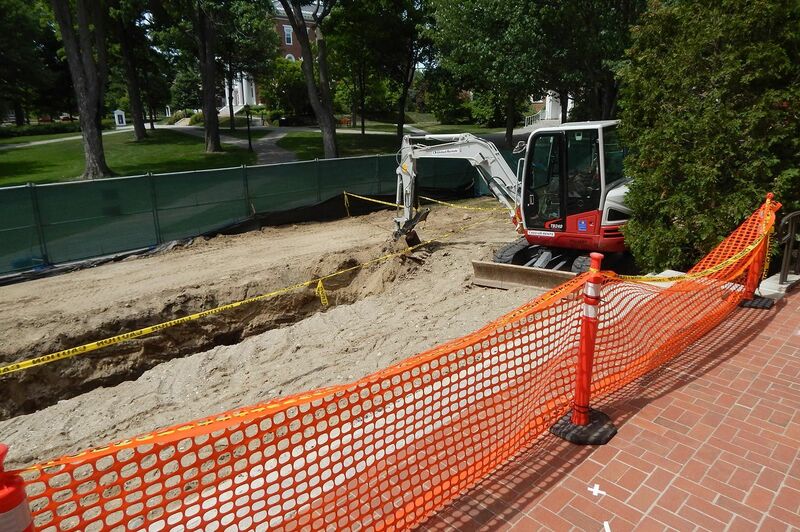 Notes From Underground: When we drifted by North Bardwell Street at midday June 20, a crew from Peters Construction, of Buxton, Maine, was laying new water pipe near the Olin Arts Center driveway. 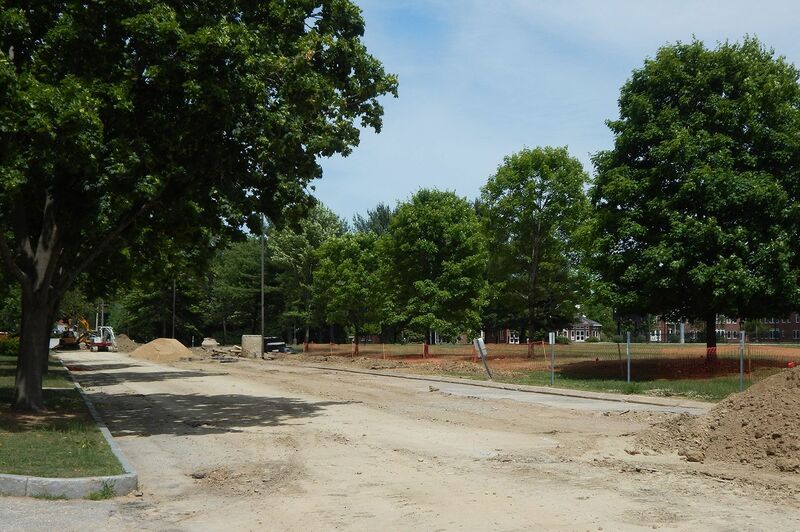 In other words, having started 800 or 900 feet away at the Alumni Walk end of Bardwell last week, they were nearly done with that phase of the work. In fact, a welder on the scene estimated that the crew had only about 40 feet of water pipe left to lay. Utilities work always comes with surprises, and there were two in this case, says Bates project manager Alan Kelley. First, the old water pipe wasn’t as deep as it should have been — it was just above the 5-foot depth that minimizes risk from frost heaves. So Peters and project contractor ATA went ahead and laid the new pipe 5 feet under — only to encounter a chunk of ledge on June 18. Maybe that was why the old pipe was too shallow. In any case, all it took was some jackhammer work (which, in fact, tends to be our remedy for any number of problems) to rectify the situation. “Knock on wood, so far we haven’t run into any other obstacles,” Kelley said. What comes next? After a weeklong break for the July 4th holiday, technicians for Texas-based Layne Inliner will start relining old clay sewer pipe along the street. And Bates got a lucky break with that work, maybe as cosmic compensation for the ledge. 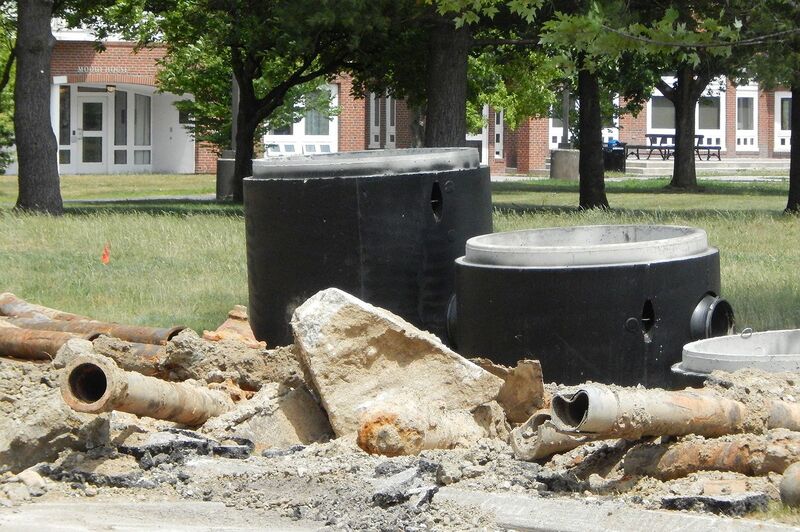 “We thought we were going to have to add a couple of sewer manholes,” Kelley notes, “but it turned out that there were some manholes already in the road that had been paved over. Keys and Rides: A project that just appeared on our radar is the renovation of the Security and Campus Safety building to accommodate two additional offices: Access Control, which provides key card–IDs and similar services, and new quarters for Kevin Plaisted, transportation coordinator. Currently housed in Chase Hall, Plaisted and access manager Susan Nattress will move to the Security building, at the corner of College Street and Campus Avenue — which was a hobby shop, soda fountain, and commercial laundry, among other things, before Bates owned it — in early August. Taking up underused space on the first floor, the renovation will also provide a new waiting area for students needing an ID or a ride in one of Bates’ spiffy new all-electric Nissan Leafs. Shelby Burgau is the project manager. Can we talk? Campus Construction Update returns in mid-July. In the meantime, we welcome your questions, reminiscences and comments about campus improvements. Please e-mail Doug Hubley, stating “Construction Update” or “What about brick raincoats?” in the subject line.